Living in Norwich gives us a wide variety of options when it comes to entertaining the children. From visiting the cinema to see the latest release, stepping back in time in Norwich Castle or the Museum of Norwich, or simply looking around the numerous shops. No matter what the activity is that has brought us into the city centre, the children will always be requesting food. With tired feet, it is nice to sit down, take a load off and enjoy a family meal together. Bill’s Restaurant is a perfect venue for this, especially with their amazing children’s menu. Located in the heart of Norwich City Centre, Bill’s Restaurant is a stone’s throw from the Castle Mall shopping centre, Norwich Market, and the Forum. Open from 8am through to 11pm, you are able to pop in and enjoy breakfast, lunch, afternoon tea and dinner service. A contemporary and quirky feel welcome you as you step in from the street. Allow your eyes to adjust to the mood lighting and soak in the relaxed atmosphere. Set over two floors, there is a mixture of tables and seating arrangements available, depending on whether you are joining them for a meal or just afternoon tea. Let’s face it when you go out for a meal with the children it needs to be somewhere that offers a great selection of children’s meals. Whilst us adults can usually find something on the menu that will do, it is all about whether the children are happy. Bill’s restaurant offers the best of both worlds, with a children’s menu that offers a variety of choices alongside an extensive adults dining menu. Bill’s Restaurants have just launched a new and improved children’s menu. Featuring a selection of fresh and seasonal fare, with an option of three courses for just £6.95 including a drink. Available at both lunch and dinner sessions. For starters, the children enjoyed crispy corn tortillas with carrot, cucumber and hummus. Before tucking into the cod fish fingers with peas, and Little Bill’s chicken burger with a sesame bun and lettuce. Just about saving room for dessert with a vanilla ice cream sundae and chocolate brownie finishing off their trip to Bill’s Restaurant. 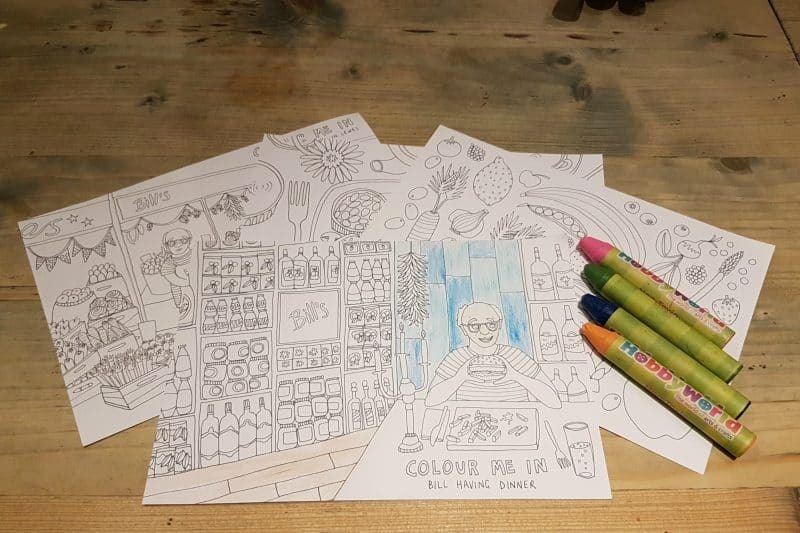 Alongside the children’s menu, Bill’s Restaurants understands that waiting for your food to come out can be a little boring so have designed some fun activity packs, featuring four different illustrations to colour in. Arriving early evening after an afternoon in the city we were all ready to sit down and enjoy a meal together. Mr. Boo and I had previously eaten at Bill’s Restaurant but hadn’t thought to bring the children, however, after seeing the children’s menu we were impressed with the selection available. Despite visiting on a Saturday we were able to be seated quickly with a highchair provided for Piglet so that she could join us up at the table too. The waiters were so lovely towards the children and were able to assist us in recommending what they liked on the menu. Also offering to bring out the children’s meals as soon as they were ready so that they did not have to wait. Throughout the meal we couldn’t fault the food or the service, it was a really enjoyable family meal. 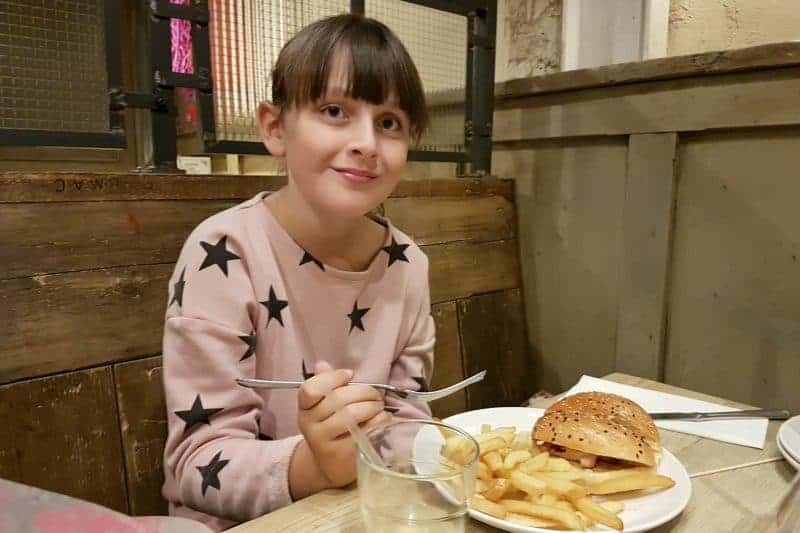 The children’s menu has really made us think about where we opt to eat with the children and somewhere that we would come back to visit – plus they have a yummy sounding breakfast menu so we NEED to try that out! Bills are always good aren’t they. Tasty food at good prices. I am sure you’ll be going again soon. The restaurant sounds very family friendly. I like that a lot. I love rustic decor in restaurants, I think it adds a bit of atmosphere. 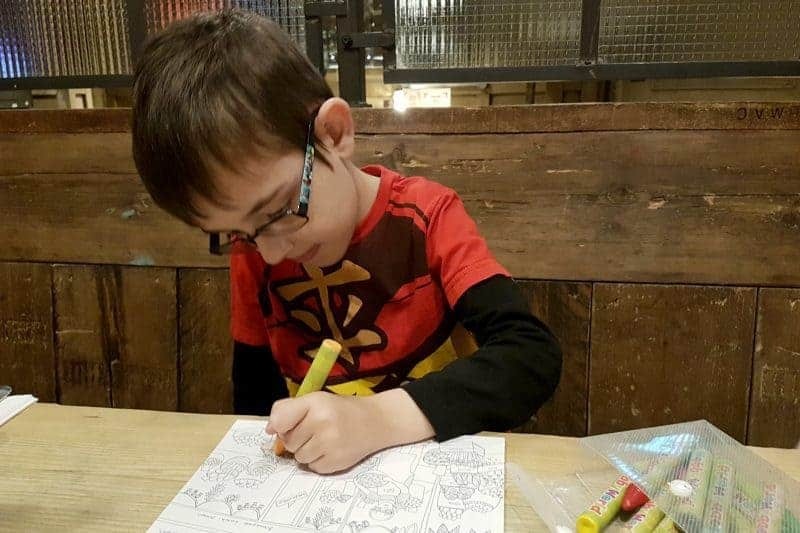 I always find milkshakes and colouring keep mine occupied until the food arrives.